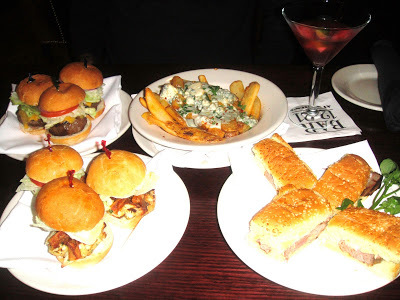 I live right by an Arnie Morton’s Steakhouse, and since I love happy hour, I decided to go there to check out their “Bar Bites” Menu. Everything on the Bar Bites menu is $6 & $7. Beer is $5, wine is $6.50, and select cocktails are $7.50 during happy hour as well. Prices may vary depending on location, but these are the prices for the Woodland Hills location. Morton’s is similar to a steakhouse like Flemings, upscale, but still nice to go for a drink and appetizers after a long day at work and watch a sports game on one of their bar TV’s. Very strong bleu cheese. If you like bleu cheese, you will love this. The cheese was a little too strong for my liking but loved the steak fries. These were my favorite. Obviously have had much better burgers, these were nothing special, but still good. The meat was good, but I felt as though something was missing. Maybe cheese would have made it better or some more sauce. I know you are supposed to taste the meat and not soak it with sauces and things like that, but it felt too bready. Maybe if there was more meat and less bread it would have been better 🙂 But still, it was good. I’m always on the lookout for great Happy Hours. Morton’s is decent- not spectacular by any means, but good for some small bites and a drink. Especially if you work near a Morton’s, it’s great to go with co-workers after work, or for a business meeting. When I went, there were a lot of men in suits that you can tell just came from work. I’ve never tried their steak or had a regular dinner there, if you have feel free to comment and let me know how it was!